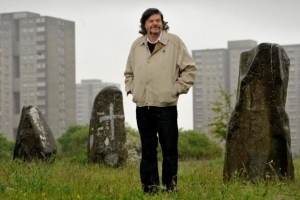 Now efforts are being made to rejuvenate the Sighthill Stone Circle, created by amateur astronomer and science writer Duncan Lunan, who brought Britain’s first authentically alligned stone circle in more than 3000 years to Glasgow’s inner city. Built on a hilltop with dramatic views across the city, they incorporate the line of the midsummer sunset across the city, which is historically mapped by Dobie’s Loan from the neolithic site, where Glasgow Cathedral now sits, to Summerhill. Lunan would like to revive the celebrations of the midsummer sunset at Sighthill, with a gathering planned for the night of June 21. “Getting the precision right was the really hard part. And the winters of 1978 and 1979 were really terrible too, you could hardly see a thing,” he said. “The moon stones were too big to be brought by helicopter so it was the sun stones and the star stones that came by air. That was a hell of a day,” he said. He built it in tribute to four academics at Glasgow University who are responsible for the promotion and understanding of ancient astronomy; Professor Archie Roy, Dr Ewan McKay, Professor Alexander Thom and his son, Dr Archie Thom. “It started with Alexander Thom who, between the two world wars, was inspired by the falling moon over the Callanish Stones,” Lunan said. Stonehenge: The axis of Stonehenge in Wiltshire is aligned with sunrise at the summer solstice. 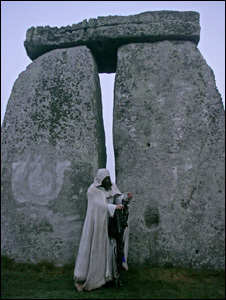 Druids and other Pagans have gathered here at different points in history to celebrate the longest day of the year. Because of clashes with police in the 1980s, ceremonies were banned until 2001. Callanish: The prehistoric site on Lewis has become a focus of summer solstice celebrations. According to local legend, the “shining one” walks up to the stone on the midsummer dawn. A path has been laid around the perimeter by Historic Scotland to lessen the damage caused by visitors. Cornwall: The Golowan Festival is held on June 23, the eve of St John’s Day. Bonfires, feasting and merrymaking define the celebration. The streets of Penzance were traditionally lined with burning tar barrels and fires blazed on nearby hills but these were scaled back for safety reasons.